It's now official. The thermometers threatening to move a notch or two and make it triple-digits outside is warranted. Summer is actually upon us. Have you heard me complain enough about how disgustingly hot it is yet? I know I'm tired of hearing myself say it. But dern-it-all...I didn't sign up for this kind of heat! I would've moved to the South if it's what I wanted. I guess I have no say in the matter, though. My gripes have gone unanswered. I will just eat and bear it. My popsicles will get me through it. Popsicles and one of the other official foods of summer. Potato Salad. Potato Salad is an official food of summer, isn't it? Well, if it's not, it should be. I've always loved potato salads dressed with vinegar the best. I love the way it seeps into the warm potatoes and flavors them so seductively. This is one of those potato salads. And it deserves top honors. Why? Because not only are there warm, vinegar-soaked potatoes...there is also tender, shredded beef. And smoky chipotles. And if that's not enough for you, there's also avocado. 'Nuff said? Good. My mouth is full of potato salad, so I couldn't say anything else anyway. Happy summer! Bring 1 quart of water to a boil in a medium saucepan. Add beef, garlic, and 1 teaspoon of salt. When water comes back to the boil, reduce heat to medium-low. Skim gray foam that rises to the top during the first few minutes of simmering. Partially cover and simmer until meat is very tender, ~1 hour. Remove meat from water with a slotted spoon and set on a plate or in a bowl to cool. Shred when cool enough to handle. Add the potatoes to the meat broth and simmer over medium until tender, ~15 minutes. Scoop out of the broth and into a medium bowl. Drizzle the vinegar over the top of the potatoes. 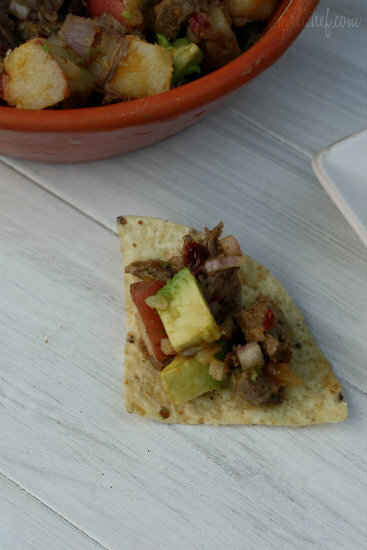 Stir the shredded beef into the potatoes along with the chipotles, onion, and olive oil. Cool and then taste and season with salt if you think it needs it. Cover and refrigerate about an hour before you're ready to serve. Fold in the avocado just before serving. I like this salad while it's still warm, as well. Just fold the avocado into the warm mixture and eat that way, if you wish. 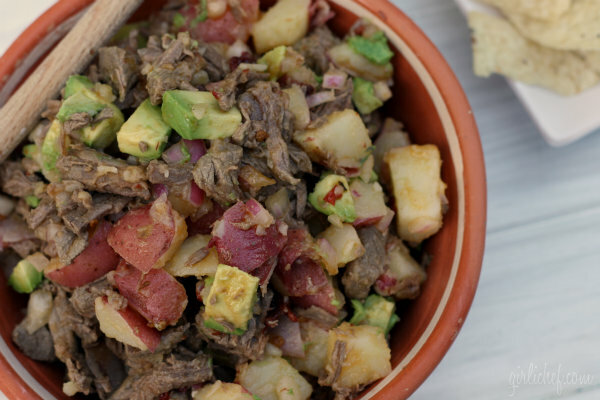 What a wonderful idea, adding beef to potato salad! And the vinegar would be a nice contrast to the rich beef flavor. What a unique potato salad! So flavorful! It's a meal all in itself. I love that! I would say that is a scrumptious potato salad. The vinegar always add good taste. It's hot over here to and getting hotter here in the valley. Thanks. Have a great rest of the week. I'll have a nice cold beer now and not just any beer. A good Mexican beer, you know the kind. tee hee. looks so wonderful and hearty! all i need now is a marg! I am so not liking this heat. But the heat in this dish? Yes! Se ve estupenda, me encanta. It's hotter than hades here in Texas too. But we expect that...because it's Texas! LOL! I love this recipe,Heather! Wonderful dish for a party! Oh yes this is my kind of dish, we love the heat in your dish. I agree that a popsicle would be the perfect treat after this awesome meal! I am sooo with you on the heat. It has been in the low 100s here all week. Ugh. This looks exactly like the sort of dish we could eat several nights a week in the summer. Our other go-to favorite for hot weather is cocktail de camarones. We have officially hit 100 here and it is awful. really awful. 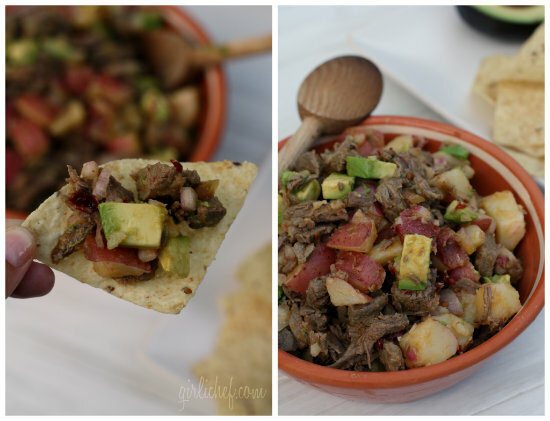 This is such an awesome take on potato salad! Words cannot describe how badly I want some of this salad, I'll have to make it... It looks amazing! This is lovely! A delicious meal in itself! Potatoes are always a favourite in my house, so this would definitely be a winner! I like that idea, beef and potato salad. I bet it would be good with shredded beef too, I normally smoke my chuck roasts until tender and then shred the meat. I could put it in at that point. Love vinegar with taters. :) Ain't a fan of Mayo. This looks really good. I love potato salad but I only tried the cold salads not something savory as this. It's been a hot summer for sure! It's kinda funny. Usually my family and friends up in northern Ohio have it at least 10 degrees cooler than we are here in KY. This year our temperatures match. Kinda crazy. I pinned this salad the minute you posted it because I knew it would be something that we would all love. OH gosh the temps are insane here and it's only JUNE!! i love this salad, it was opne of the first recieps I tried when I got the cookbook!! yummy! Now this is a potato salad! It's going on my list! I can't complain about the heat but it has been humid here. ;-) This salad looks wonderful--especially with that avocado. Thanks for sharing it with Souper Sundays. This would be great as a quesadilla filling! Looks delicious! of this week's Food on Friday is Salad. It would be great if you linked this in.